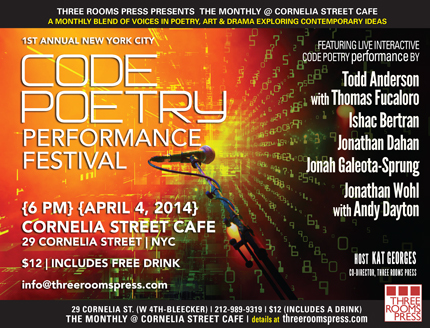 Code poetry performance is changing the landscape of the poetry scene! Code poetry — poems written in computer code — has found new resonance in a world increasing integrated with electronics. According to the San Francisco Chronicle, “Code poets find resonance between the constraints of programming and the traditional rules of peotry, where forms like the sonnet dictate strict rhyme schemes and syllable counts.” Code poets are masters of both programming and poetry, and are compelling — and daring — visual and performance artists. The NYC Code Poetry Performance Festival presents five top New York-based code poets, who will astound with their interpretations and breakthroughs transforming poetry as we know it. Featured code poets include Todd Anderson with Thomas Fucaloro, Ishac Bertran, Jonathan Dahan, Jonah Galeota-Sprung, Jonathan Wohl with Andy Dayton, and host Kat Georges.